In TSOTA’s first piece from Sheffield, Virginia Lowes reviews the latest exhibition from printmaker, painter, animator, and filmmaker Jo Peel. Through prints, drawings, paintings, mural, and film, Jo Peel’s exhibition Sheffied City, City on the Move, currently in the Milennium Galleries, explores the parallels between Sheffield, UK and Pittsburgh, USA. Both cities were irrevocably shaped by the steel-making industry and are now post-industrial landscapes. Both Sheffield and Pittsburgh lived through jubilation at the height of their industries and then struggled in later years. Steel City, City on the Move reveals the variety of community and culture which exists within the twin cities. Each chapter tells the story of two residents, one from each city, who are connected by their interests or businesses. It’s a heartening, insightful glimpse into the richness and depth of ordinary people’s lives: tattooists and landlords, grocers and metalworkers talking about their own lives and how they feel about the regenerating cities in which they live. It demonstrates how our heritage informs our present-day sense of identity. Around the gallery Jo’s prints and paintings are instantly recognizable in her perfectly observed and uniquely executed style. She uses line drawings and a minimal colour palette to portray the crumbling, desolate or regenerated buildings of the cities. Inspired by community, change, and the environment, Jo believes that every building has a story and she is motivated to tell those stories and to encourage people to care about their surroundings. Jo’s work has been exhibited in Japan, Indonesia, Hong Kong as well as numerous London sites and galleries. She and other artists set up the Community Kite Project 2011, she painted large murals for the London Design Festival 2012, and she’s created way too many other artworks and installations to count. 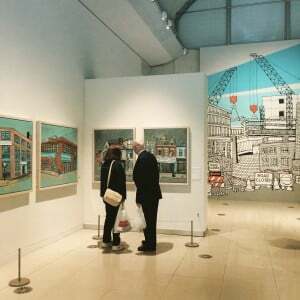 Steel City, City on the Move is at the Millenium Galleries until Sunday 11th October. To find out more about Jo and to see her work, visit her website at www.jopeel.com and keep your eyes open as you walk around Sheffield.